Gozio’s exceptional wayfinding technology now features deep integration with Epic EHR creating a mobile patient experience that seamlessly takes patients from an appointment reminder to navigating directly to their point of care. 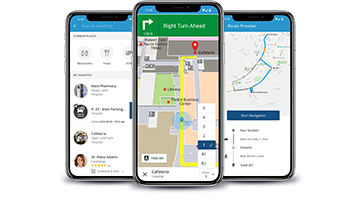 With the arrival of Epic App Orchard deep integration, Gozio’s mobile wayfinding platform enhances the patient journey with transformational improvements in access to care. The deep integration of Epic EHR optimizes patient workflow and creates a fluid experience as patients interact between their electronic health records and Gozio’s experiential wayfinding platform. Patients can easily receive appointment reminders, then go directly to step-by step directions from their home to the right parking garage and on to their point of care. After their appointment, they are guided to return to their car with a parking spot locator and can efficiently schedule follow up appointments, message their caregiver, access lab results or prescription information. This continuity of care is completely accessible from Gozio’s hospital-branded wayfinding app on a patient’s smartphone and reinforces the role of experiential mobile wayfinding in developing a patient-centric approach to care. With Epic App Orchard, Gozio’s experiential wayfinding platform does more than fulfill its fundamental mission of helping patients find their way around facilities. It proves that experiential mobile wayfinding is a valuable channel for health systems to engage with patients — before, during and after each encounter — in a way patients appreciate. Now more than ever, Gozio’s experiential wayfinding platform is a must have solution for improved patient experience. Gozio has hospital wayfinding and the patient journey dialed. As patients expect a healthcare mobile experience that gives them access to medical care at their fingertips, Gozio’s experiential wayfinding platform with Epic App Orchard delivers uncompromising access to care and improvements in patient workflow. Gozio’s success in developing experiential mobile wayfinding platforms that solve navigational challenges in the patient journey and improve overall patient experience make it the leading choice for hospital’s who prioritize a patient-centric approach to care.